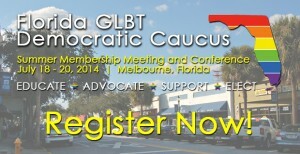 The Florida GLBT Democratic Caucus is pleased to announce plans for the upcoming Summer Membership Meeting and Conference, held July 18 – 20, 2014, in Melbourne, Florida! The membership meeting will include general Caucus business as well as discussion and voting on proposed bylaws amendments. As always, there is no cost to attend the membership meeting. Additionally, the Caucus will host an informative conference designed to educate members and strengthen local chapters.